I´ll transfer the blog and content in the following days to Eliot. He´ll push the bicycle mission further. Please support him and the hubstripping idea like you did the past 2 years. I want to thank all of you who read comments, wrote comments, supported cyclists who need help….. YOU made hubstripping to what it is today! I made the decision to stop managing this blog. My interests have changed a bit. I´am still on bicycles especially tandem. I bought some tandem from the company Hase bike in Germany. The tandem is called PINO. I started to rent the tandem under the company name called “RENT-A-PINO“. All the PINO bicycles come with a Rohloff Speedhub. So the internal geared hubs are still my favorite choice. So if you are interested to ride with the PINOs through Germany or Europe please let me know. If there is someone interested to work further on the hubstripping project please let me know this by using the comment field below. I offer the domain “www.hubstripping.com” and the account of this wordpress blog with the stored content. 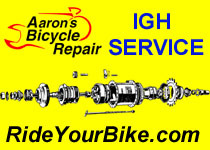 I would like to hand over this project to someone who will develop the hubstripping idea further and give cyclists a platform to discuss all concerning topic about internal geared hubs. Please give me your feedback until 1st of September. The guy is in the second year of his job training as a bicycle mechanic. His stripps a 7 speed sachs / sram hub within seconds. Thanks John for the link! On a Cycle-show 2009 S&A showed a 2 Speed kickback hub with a coaster brake like the DUOMATIC from Fichtel&Sachs. Details can be found on MOULTONBUZZ.com …. Shimano announces a 11 gear hub. The range will be 409% (Alfine 8 gear 307%). The hub runs in a oil bath like the Rohloff Speddhub. This should result a higher efficiency and longer lifetime. The price will be 300,- Euro release data is September 2010. Check out our official Alfine 11 page for more info. The company who provides the lever is called Sussex Enterprises. More informations can be found here! Thanks Detlef for this valuable information! Thanks John for sharing your NTWD “Non Turing Washer Design” for the DUOMATIC hub. I recieved this link from John Isles. Thanks a lot! 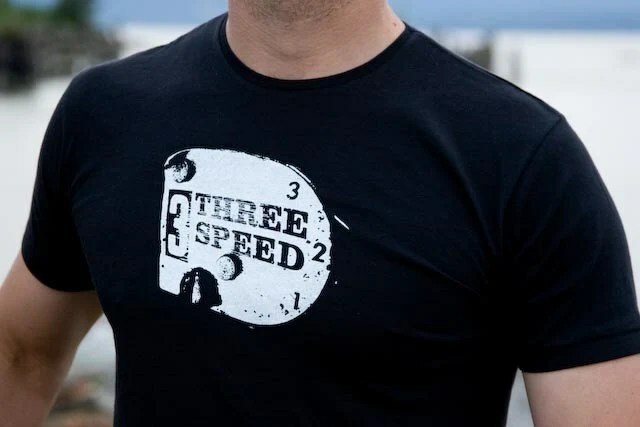 I like this T-shirt don´t know why!!!!! 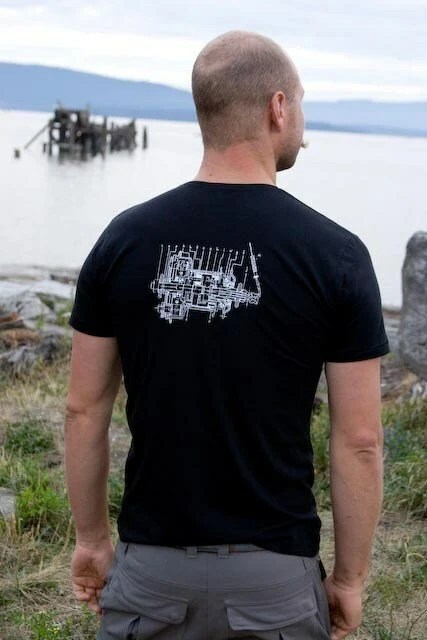 The backsite is real hubstripping! The steel chain fades away…. – No dirty trousers anymore because of chain oil! – No need to oil the chain. Less maintenance! – New design possibilities. The chain case is reduced to a stylish spoiler! The modifications on the bicycle frame are minimal. A srew on the rear chainstay allows you to open the frame and to put the carbon belt inside the frame triangel. The SIMPLE bicycle has a mechanical sled on both sides of the dropout to adapt the distance between bottom bracket and rear dropout. This makes it easy to fit in the belt the first time. In case of a flat tire the sled is not needed because there is no big tension on the belt. The depth of the tooth is so high that it accepts a low tensioned belt. 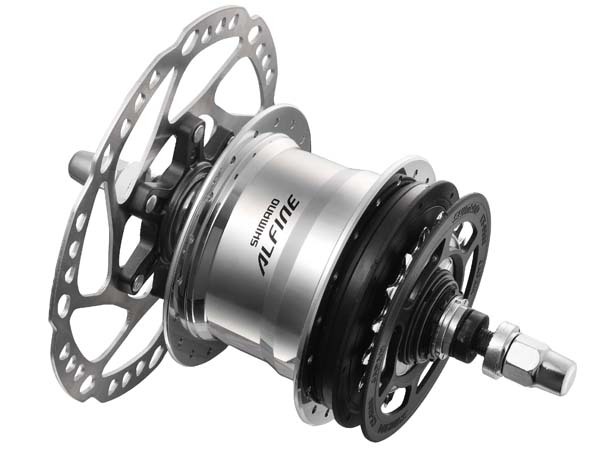 The optional hubs are the Speedhub from Rohloff and the SHIMANO Alfine. During the testride I noticed via my legs a smooth feeling! Let´s see how the longterm behavior ot the belt will be! The days of the steel chain are numbered. First we´ll see a replacement in the premium city and touring bicycles. Because of the price and the customized frames. But prices for the belt will fall and the bicycle mass market will absorb a new technology! Other drivetrain alternatives are discussed in this video… (sorry only in swiss language!). Using a Nexus or Alfine internal gear hub from Shimano with a drop bar or a road style handle bar was not possible. The problem were the available shifters. Jtek a engineering company from Hugo, MN has developed a bar-end shifter. The shifter is very light which hopefully has now influence for his lifetime. From the distance it looks like the main parts are made out of aluminium. Also the design locks rigid! The clamping part needs a 24mm bar diameter. Thanks to Bob for this information! This is real bicycle fetish!